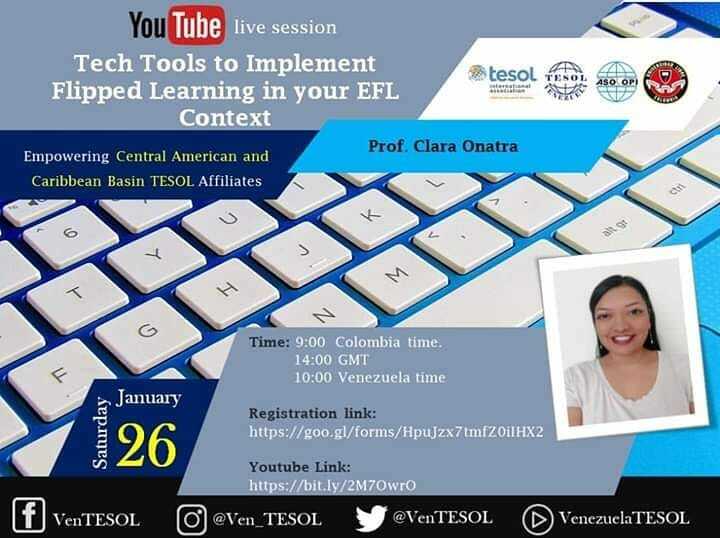 Venezuela TESOL (VenTESOL) and the Central American and Caribbean Basin TESOL Affiliates cordially invite you to the “Tech Tools to Implement Flipped Learning in your EFL Context” Youtube live session. Whether you know what Flipped Learning is or you have no idea about it, you shouldn’t miss this webinar! It will present general assumptions regarding this pedagogical approach and will show certain effective tools to be used when implementing Flipped Learning in an EFL context. Clara Onatra is currently enrolled in a PhD program in Education at Universidad de Baja California. She works as a professor and researcher at Universidad Libre in the BA in foreign languages program. Her research interests are ICT in Education, Flipped Learning, Autonomous Learning and Second Language Acquisition.